How does a wind turbine generate electricity? Everyone knows that they do, but not everyone understands all the factors involved in the mechanisms of wind turbines. Wind power has been used for over 5,000 years to power sailing ships, and it has been used to generate electricity since 1887. There are wind farms in use all over the world today, and many small wind power applications for personal or micro applications. Wind power is an important part of our future. It is useful for everyone interested in wind power to understand the answer to the question: how does a wind turbine work? The earliest wind turbines were built with flat blades, depending on the angle (pitch) of the blade to turn wind power into rotational power. The windmill that Don Quixote tilted with was an example of this. With the development of the airfoil shape to generate lift for the wings of heavier-than-air flight, more efficiency became possible in rotor design. Almost all modern rotors use airfoil shaped blades. Blade length is an important consideration in how a wind turbine works. Longer blades apply more torque at the hub, but require stronger and lighter materials. Tip speed also becomes an issue. A rotor with a diameter of 100 meters at a leisurely-looking 15 RPM will have a tip speed of 4,710 m/min, or 175 MPH. This endangers birds, and makes blade erosion an important factor. Another factor worth considering in deciding rotor size is noise. The sound of a long blade’s tip moving through the air can travel quite a way, and can become an annoyance to wildlife and people. Nobody has developed a silent rotor yet, but research into quieter designs is ongoing. If a rotor was able to extract 100% of the wind’s kinetic energy, the air behind the rotor wouldn’t be moving at all, and would prevent the incoming wind from moving. This is called the Betz Limit. Combined with the turbulence from one blade interfering with the blade that trails it, the most effective design we have so far is three slender blades to a rotor. There are two basic styles of wind turbine: horizontal axis and vertical axis. The horizontal axis, with propeller style blades rotating perpendicular to the earth. These are the most common. Vertical axis wind turbines turn in a plane parallel to the earth. These can be divided into two types: upwind and downwind. This depends on whether the blades are upwind or downwind of the tower that they are supported by. Downwind turbines are less efficient because of the turbulence caused by the tower. For maximum efficiency, upwind turbines must face into the direction the wind is moving. Smaller turbines can be held in this direction with a wind vane. Larger turbines typically use sensors and a motor to keep the turbine facing into the wind. 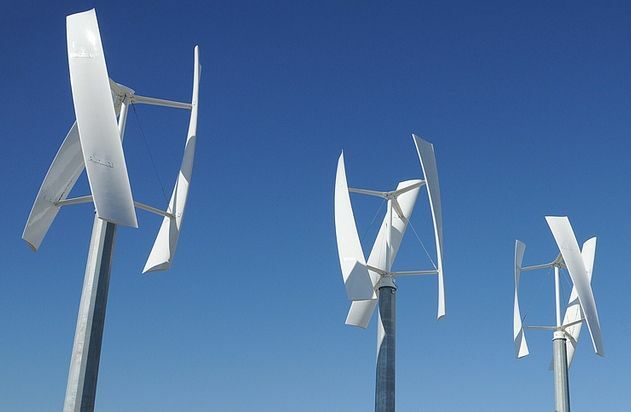 Vertical axis turbines work as efficiently no matter which direction the wind is blowing. There are several styles of vertical axis turbines. Darrieus (aka ‘eggbeater’) turbines, use blades shaped like airplane wings in cross-section, using the lift to move them horizontally. Savonius turbines use scoop-shaped blades or cups to catch the wind and spin. Each has problems with either stress or efficiency that make them less efficient than horizontal axis turbines in most applications. Michael Faraday built the first electric generator in 1831, demonstrating that a rotating magnetic field would produce electrical current. There have been remarkable improvements to his design in the years since. A variety of types have been developed for use in wind turbines. In some small wind turbines, a DC generator will recharge batteries or power LED lighting. Most large wind turbines use an AC generator and connect directly to the power grid. Small turbines can spin quickly enough for direct drive to the generator. Large generators are connected to the blade hub with a gearbox or transmission that increases the speed of rotation to power the generator. How does a wind turbine work to avoid turbulence? Well, tower design is an important factor. Wind near the ground has more turbulence caused by the surface of the earth than wind higher up. This is known as the boundary layer, and keeping the rotors above it is one important purpose of the tower. The tower is a balancing act between cost and effectiveness. Getting the rotor higher for maximum effectiveness also causes more stress to the tower. The wind is not only turning the rotor, it is also pushing the tower over. A higher tower is also a longer lever, with the base of the tower being the fulcrum point. The nacelle that the rotor is attached to is often designed aerodynamically to minimize air drag because of this. Latticework towers cause turbulence as well as experiencing wind drag themselves. For this reason, towers that are cylindrical in cross-section are used for most large scale towers. Cylindrical towers also have turbulence and drag, but less than latticework towers do. Research continues to develop improved tower designs to enhance strength and reduce construction costs. There are several components to wind turbines, and many people do not understand how complex the considerations can be. While this essay isn’t enough to make anyone an expert, we do hope that you’ve learned some interesting things and you can now answer how does a wind turbine work?. 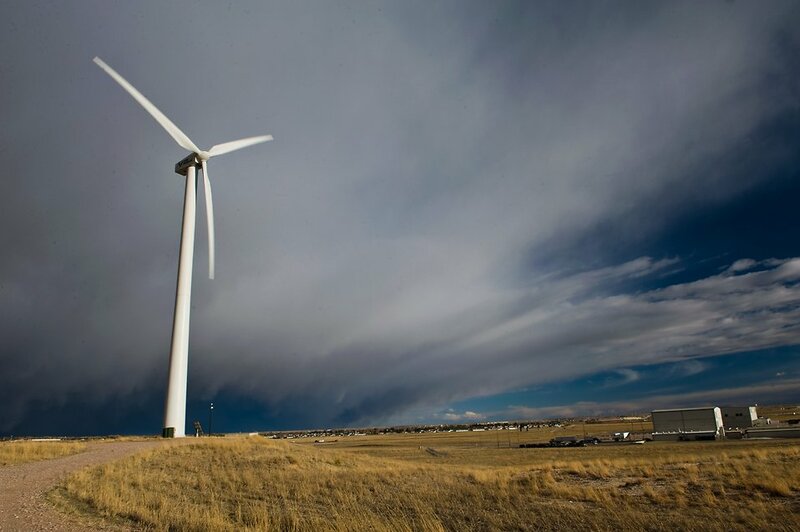 With a better understanding of how a wind turbine works, you can look for opportunities to explain this to acquaintances while discussing wind power. You will be better equipped to convince some wind power skeptics, who may not have a good understanding of green energy. Our world must shift away from fossil fuels for more sustainable power sources. Advocacy now is important for the planet’s future. To be an effective advocate, knowledge of how wind turbines function as well as other green methods is vital.